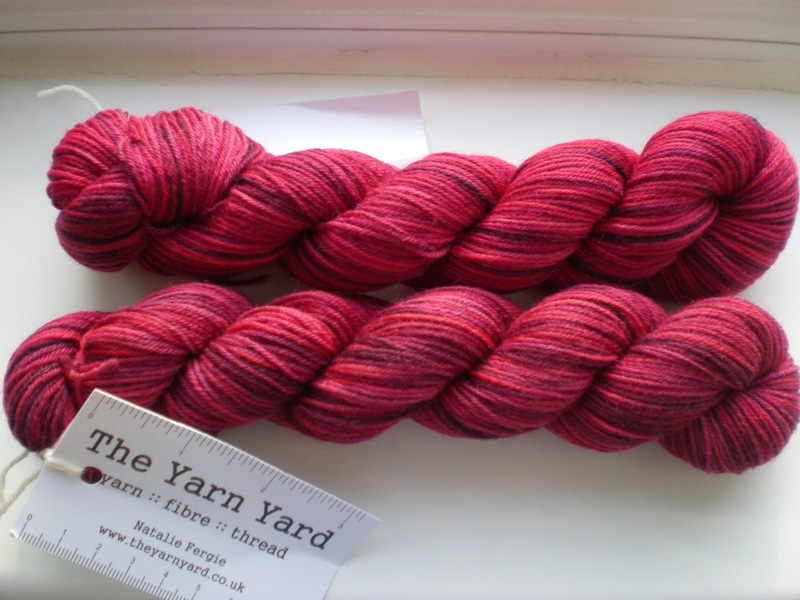 Natalie over at The Yarn Yard has started the small skein society. I signed up before the New Year and received my first parcel yesterday. I signed up for the two skein and choconastick option. This yarn club is great for those who like to knit socks or mitts or who want yarn suitable for colourwork. I went for the two skein option because at some point soon I really must start knitting socks again. Both the Husbeast and my father keep asking me for pairs and I would really like some more myself. The first delivery was fantastic as it contained two skeins which have so many of my favourite colours in them and three of the choconasticks. Natalie has hand dyed these skeins with brushes in small sections to try to ensure there is no pooling if we do use them for socks or mitts, where you can get pooling on the heels or thumbs if you are working short rows. I would have liked to have included a picture of the whole parcel, you know with the chocolate... But that disappeared within two minutes of me opening it! To be fair I did actually include the chocolate option because I thought the Husbeast might be happy about yarn appearing every month if it had chocolate inside for him. Not that he is ever disapproving about my yarn stash luckily, he's very good to me, but still a little bribery goes a long way. Apparently the chocolate was rose flavoured and made a hot chocolate which tasted of Turkish delight. He did at least let me have a few of the marshmallows which came with it. However this wasn't the actual point of the post. I've mostly written it because I wanted to praise Natalie at the Yarn Yard for her fantastic customer service. When I signed up she double checked my address because I'd moved since the last time she sent anything to me and she wanted to make sure she had the right address. She then offered from the second parcel onwards to wind the skeins into cakes for anyone who wanted it. Well considering I have pain in my right shoulder most days from an old accident, and winding yarn exacerbates it, I think I answered her before she'd even finished typing the request. She then gave me the option to have it in one cake or two and just generally was so helpful and accommodating I wanted to just say a public thank you. Being a knitter who mostly uses yarn from UK indie dyers has spoilt me. If I order it its generally here within a couple of days, the dyers are easily accessible on Ravelry to answer any questions and they are so helpful. Unfortunately I now get grumpy with other shops both online and bricks and mortar if they don't live up to the high standards set by the yarn shops. If you want to sign up to the Small Skein Society you can do so here.